Claus Skadkjaer sees twice the opportunity for eyewear in Asia and is opening people’s eyes to the functional and fashionable possibilities. It’s one of the classic rags-to-riches tales of the business world. At the age of seven, a young Leonardo Del Vecchio was sent to a Northern Italian orphanage by his widowed mother, herself struggling with too many mouths to feed. Later, he served an apprenticeship in a Milanese tool factory until 1961 when he established his own business supplying parts for spectacles. Under his direction, this company – Luxottica (ottica is Italian for optics) – would become the largest eyewear company in the world, catapulting him onto the Forbes Billionaire List (where he currently sits at number 50), and earning him a residence in Monte Carlo and the title of Italy’s richest man. Testaments to his business acumen include the 1999 acquisition of iconic, yet flailing, eyewear brand Ray-Ban, nursing it back to the cult status it enjoyed during the Aviator-wearing Tom Cruise Top Gun heyday. The company was also listed on the New York Stock Exchange in 1990, and later Borsa Italiano in 2000. At 82, Leonardo is still very much the visionary. After attempting retirement in 2004, he returned to take the reins a decade later, masterminding the merger with French lens manufacturer Essilor, officially announced in January 2017. Forbes predicts that the amalgamation is projected to capture up to 27% of the global eyewear market. “If I’m like Leonardo is at 82, I’ll be very happy,” Claus Skadkjaer laughs. 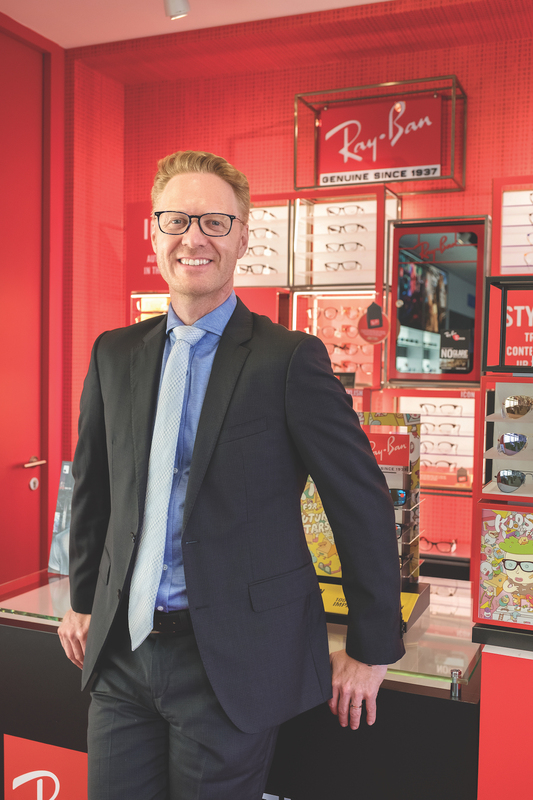 Claus traded in 15 years at Proctor & Gamble to move into the eyewear category when he became Luxottica’s managing director of South East Asia and Hong Kong–Taiwan in 2012. Words like “entrepreneurial”, “passionate” and “visionary” pepper his explanation of why he jumped at the opportunity to join the firm that counts Ray-Ban, Oakley, Persol, Vogue Eyewear, Oliver Peoples, Alain Miki, and Arnette as proprietary brands and produces specs and shades under licence from luxurious labels such as BVLGARI, Chanel, Dolce & Gabbana, and Prada.